Balloon Cups and Sticks . Hold balloons easily with these plastic sticks and cups. These colorful balloon sticks are a party essential and an easy way to create party favors. Also used to display customized printed balloons. Qty: 100 pieces sticks and 100 pieces cups. Importnat Note : These balloon sticks and cups comply with CE EN71 European Toy Safety Standards unlike the locally available ones that are made from cheap PVC that contains phthalate , a dangerous cancer causing chemical that is banned in the children toys, as phthalate leches into the skin. 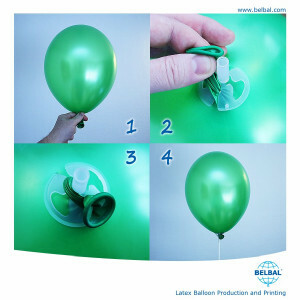 1.Inflate your latex balloons with air using a pump or balloon inflator. Tie a knot into the neck of the balloon or continue without a knot. 2.Sit the balloon in the cup part and stretch the neck of the balloon. Place the neck trough one of the slots on the cup. 3.Pull the neck outside around the cup to the slot on the opposite side and return it again inside the cup to the slot from the begining. 4.Push the stick into the cup, your balloon is now secured and ready to hand out.